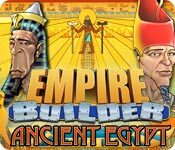 Become ancient Egypt`s greatest architect and construct world famous monuments as you raise an empire from the sands of time! Help powerful pharaohs build along the lush Nile River and solidify their life legacy in Empire Builder - Ancient Egypt. This detailed Strategy game challenges you to protect your people from locust plagues and terrifying mummies, while creating some of the Wonders of the World! Revisit your favorite Diner Dash episodes with Flo and Grandma through five seasons of Time Manangement fever.